The book takes a fresh look at one of racing’s most memorable years through the eyes of Chris Amon, the young New Zealander who had just joined the Ferrari team. For Amon, 1967 began with victory at the Daytona 24 Hours, but soon turned tragic with the death of team mate Lorenzo Bandini at Monaco. At Spa, another spectacular accident put Mike Parkes out of action with two broken legs, and prompted Ludovico Scarfiotti to quit the Ferrari team. That left Amon to fight alone until the last race in Mexico, scoring four third places and finishing fourth in the Drivers’ Championship. While Amon and Ferrari take centre stage, ’1967’ also looks at the other drivers, teams and events that shaped the campaign for the championship. 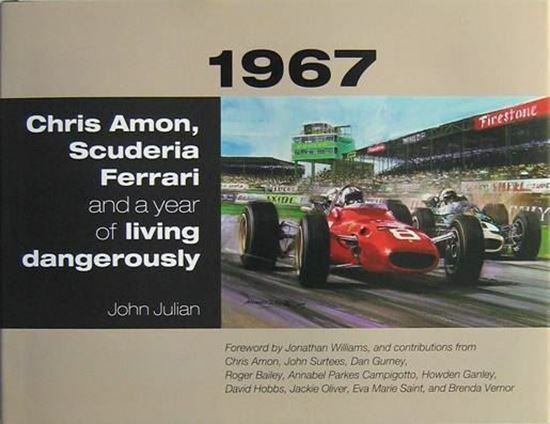 The book includes observations and memories from such leading drivers as John Surtees and Dan Gurney, as well as informed insiders like Amon’s countryman Howden Ganley, Enzo Ferrari’s assistant Brenda Vernor, and Grand Prix movie star Eva Marie Saint. It also goes beyond Amon’s time with Ferrari, covering both his early years with the Cooper and Parnell teams, his 1966 victory at Le Mans with Bruce McLaren, and his later career with March and Matra. John Julian’s vibrant prose and extended quotes from key characters in the story make ’1967’ a fast-paced read, with a wealth of photographs adding atmosphere and excitement. And while the book includes enough detail to satisfy the most serious fan, it also offers a wider view of a bygone era by noting other events in the news, popular songs of the day, and local details about each major race.